All spiders are predatory eight-legged creatures that have organs to spin silk at the back ends of their bodies. They are the largest part of the Arachnid family, a group that also includes scorpions and ticks. Spiders all have the ability to bite with venom-injecting fangs to kill prey and nearly all of them are poisonous (even if it's just a little). There are about 40,000 types of spiders in the world, living on every continent except Antarctica. Spiders are generally good to have around as they help minimize the population of harmful insects. The problem arises however when they negatively affect humans. The mere sight of a spider can be a real scare for some people. 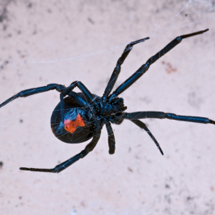 Aside from that, many spiders do bite humans and are poisonous, so it is a good idea to have a pest control company address your spider infestation. We offer both inside and outside applications to control spiders. Native to Europe, the aggressive house spider, or western hobo spider, was accidentally introduced to the Northwestern United States in the 1980s. They are found primarily in Washington, Oregon, Wyoming, Colorado, Utah, Idaho, and Montana (the Pacific Northwest United States). Hobo spiders belong to the family Agelenidae, a group of spiders known for their funnel-like web construction. These arachnids spin horizontal layers of entangled silk threads that serve as nests, detection devices, and traps for potential prey. 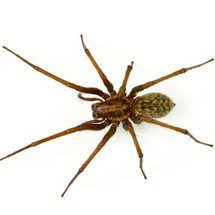 The hobo spider is one of a small number of spiders in North America whose bites are generally considered to be medically significant. Hobo spiders sometimes build their webs in or around human habitations. Although this species of spider has a reputation for aggressiveness, they will normally avoid contact with humans. Most bites occur when the spider is accidentally crushed or squeezed by a human. The spider's venom is strong enough to cause considerable local pain and possibly necrosis. Hobo spiders are brown and measure roughly 12 to 18 mm in length. Their legs show no distinct rings and have short hairs. Their abdomens have several chevron shaped markings. Males are distinctively different from females in that they have two large palps that look like boxing gloves. The females also have these palps, but the ends are not as 'swollen' as they are on the males. Females tend to have a larger abdomen when compared to males. The black widow spider has a reputation for being one of the most dangerous spiders in the world. This is because they have very large venom glands. When they do bite, most of the time it is the female. The males almost never bite humans but it has been known to happen from time to time. During the cold time of year they will hide to find shelter. This is when there is the greatest risk of them being in homes. This species are nocturnal and very shy. However, females can be aggressive if they are disturbed. A bite from a black widow spider is very dangerous. It is going to be very painful due to the volume of venom they produce. Immediate medical attention is important to prevent the venom from spreading. If it isn’t taken care of fast, there could be irreversible damage to the tissues of the body. Females have the telling sign of a red hour glass or red dots on them. The males have this feature in yellow or white color. They are also about 1/2 the size of the females. Males are often mistaken for other types of spiders because they are usually brown in color rather than black. 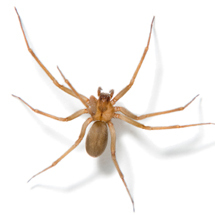 Instances of individuals seeking medical care following a confirmed brown recluse spider bite in our area are uncommon. These spiders are less than 1 inch long. They come in all shades of brown with a medium coloration being the most common. You will also find some that are black, cream, or gray. This is why people are often not sure of the type of spider they happened to see.